AltCoin DonationBox: a responsive plugin that lets you accept Bitcoin, Ethereum, and Litecoin donations. You can change color, address, and other settings in the backend. 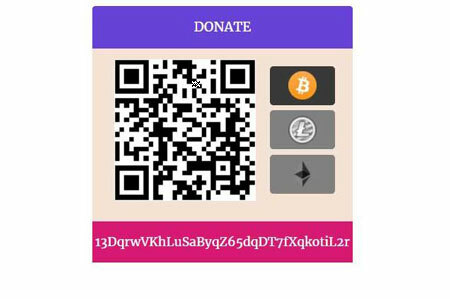 Easy Bitcoin Donation Widget: a simple widget that lets you display a bitcoin donation QR code in your sidebar. You can change donation amount, widget title, and other settings. Digital Paybox: lets you sell your digital products or simply accept Bitcoin donations. You can allow your visitors to set their own price. Have you found better Bitcoin donation plugins? Please share them here.